Just in time for Easter, or for your hard-boiled egg-eating pleasure! 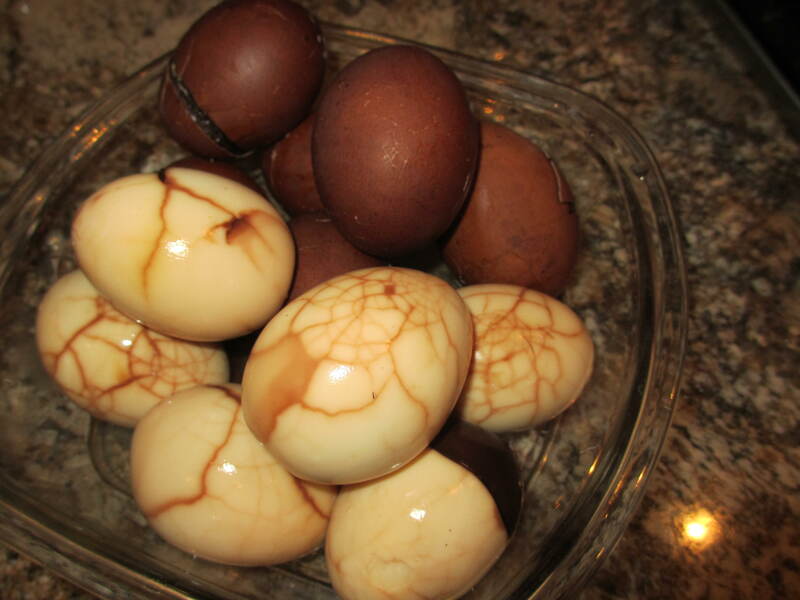 I stained a dozen boiled eggs to snack on during our Passover Seder, as is Sephardic custom. 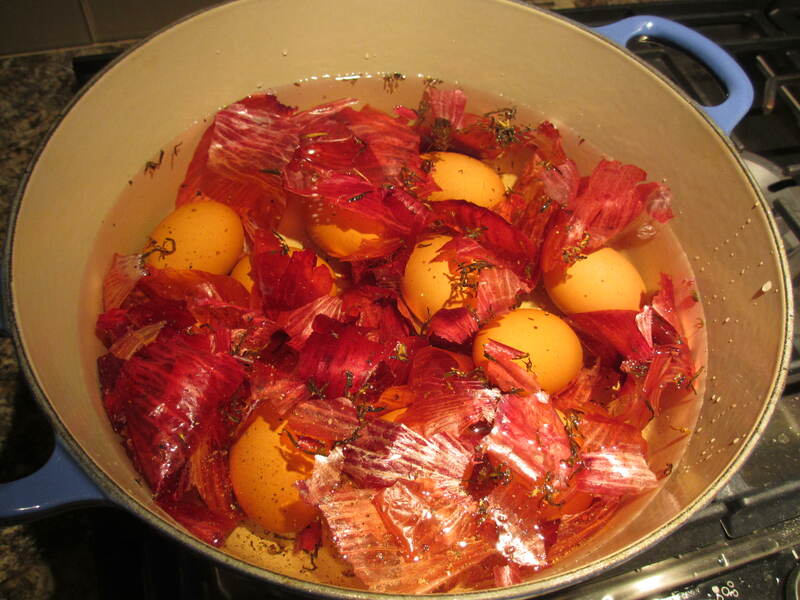 These eggs are stained by gently simmering them in a brew of black tea and the outer skins of red onions. After they simmer for about 1.5 hours, the shells are gently cracked randomly and placed back in the simmering water for at least another hour. This creates delicate spider web patterns inside the shell and gives enough time for the color to infuse and darken. I needed a large amount of red onion outer skins, more than I would have gotten from 1 or 2 onions. And I didn’t want to buy a bunch of them since we can’t eat them that fast. So I must confess, I went a-scavaging. In the grocery store’s product department, rifling through the red onion bin collecting loose skins. I got a few strange looks as I stood there for about 5 minutes, but I got what I needed. The cashier thought I was bonkers when I handed over the bag of skins to pay. 1. 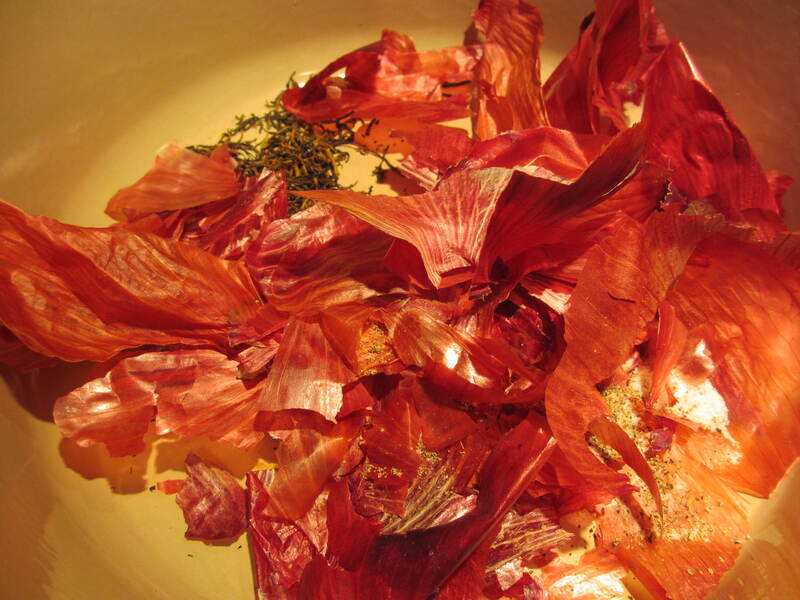 In a large pot, add tea, onion skins, salt, and pepper. Gently place eggs in bottom of pot, then fill with enough cold water to cover the eggs by about 1.5 inches. 2. Gently bring water to a simmer. 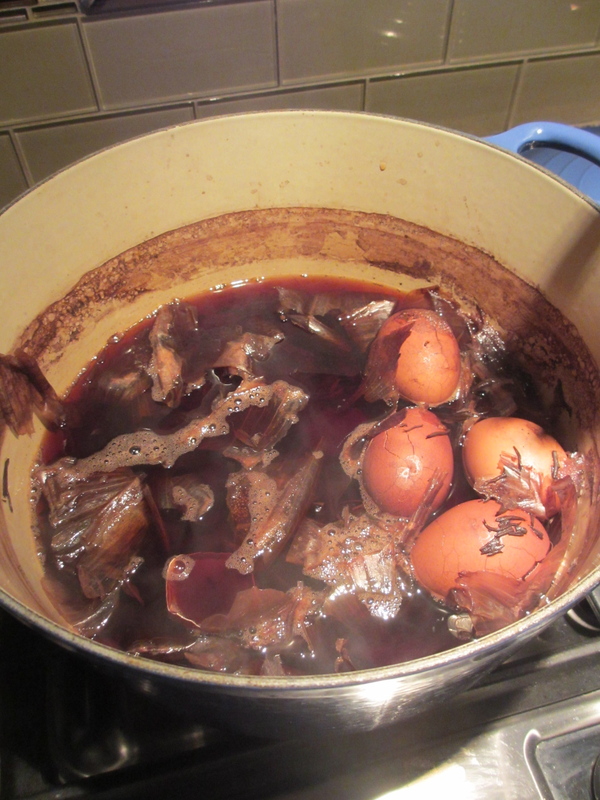 Do not let boil, or the eggs may crack, which will leave a thick dark brown stripe across the egg. Gently simmer about 1.5 hours. 3. After 1.5 hours, the egg white should be set. Scoop each egg out of the pot one at a time (I used a spaghetti spoon) and gently crack in different areas using the bowl of a spoon. Gently return to the pot and repeat until all eggs have been cracked. 4. Cook eggs at least 1.5 hours longer. 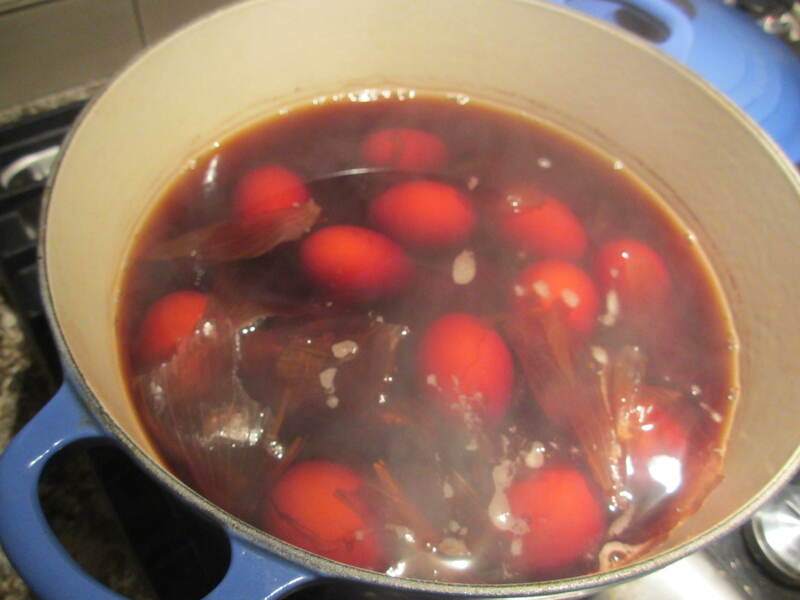 Remove eggs from pot and shock in ice water to stop cooking process. 5. 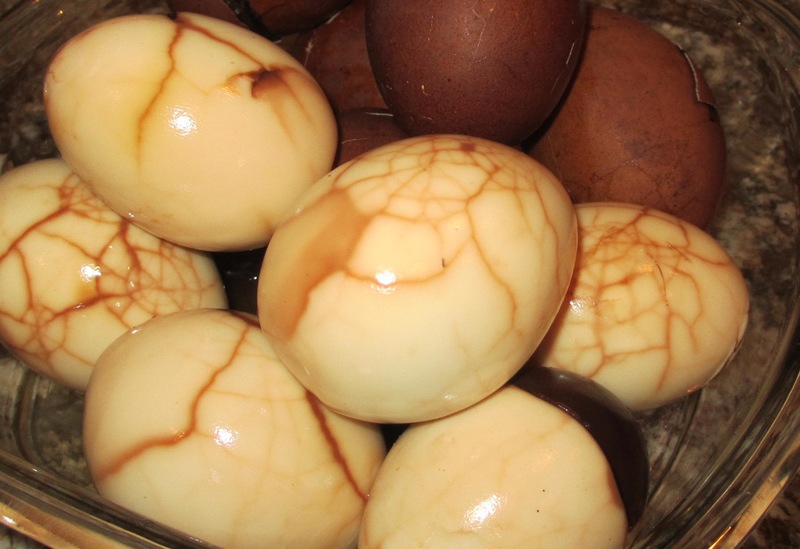 Peel eggs, revealing unique patterns. Refrigerate until ready to eat. 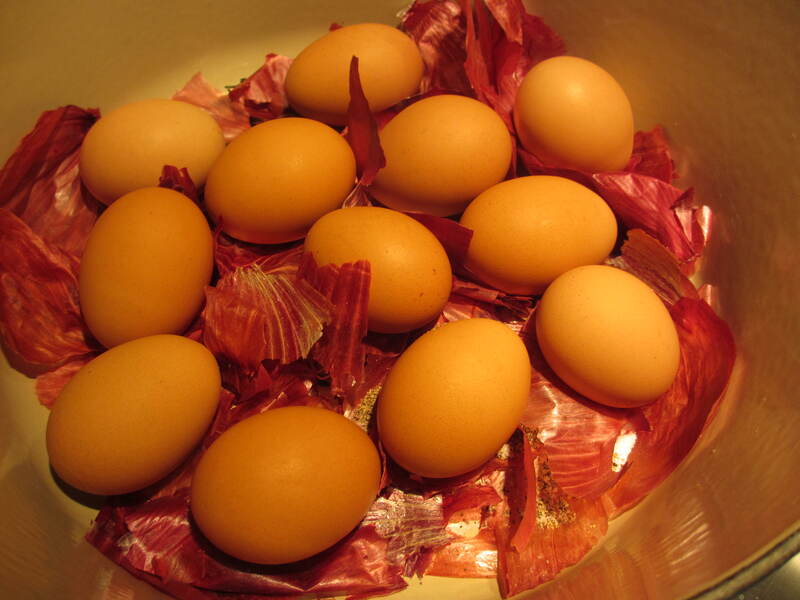 Even unpeeled, these eggs will not last as long as regular hard-boiled eggs since the shells are not intact.